SOUTH-END, in Essex, is almost wholly a new creation. 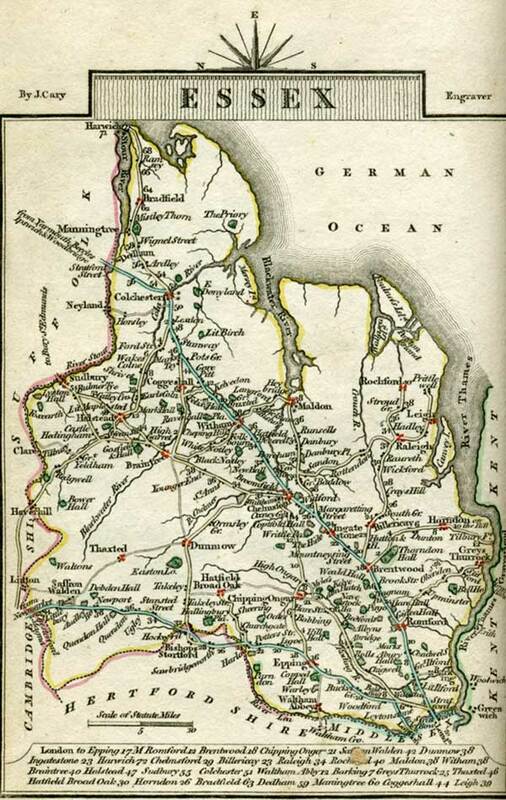 It is eligibly situated on the slope of a well cultivated and well wooded hill, about forty-three miles from London, and three from Rochford, and lies at the mouth of the Thames, nearly opposite to Sheerness. The soil about this new establishment is sandy, and the shore flat and so shallow, that at low water a stranger would suppose the sea had bidden goodbye to the place, and never more meant to return. The water, however, notwithstanding its admixture with she Thames, is sufficiently salt, and very clear, and for some hours every day is not only safe, but extremely agreeable. The most timid, indeed, need not fear being out of their depth; and those who can swim may here amuse themselves without apprehension. There are several bathing machines in daily use; and, as South-End, from its vicinity to London, is likely to draw still more company, no doubt its accommodations will keep pace with the encouragement given to adventurers and speculators. Part of this village being built on a considerable eminence, gives the houses a stately appearance at a distance. They run in a long line, and being handsomely finished with pilasters and cornices of stone, might pass for a palace, to a stranger sailing up the Thames. Indeed, the lodgings in general are commodious, and the place is well supplied with the prime articles of life, though some of its luxuries are still wanting; but these will doubtless be supplied, in proportion to the existing demand for them. Though South-end was scarcely known as a bathing place twelve-years ago, it is already furnished with its assembly-room, its theatre, its library, its hotel, and its inn. The ASSEMBLY-ROOM is handsomely finished, but is not yet regularly filled, at any stated periods. Sometimes, however, the company is pretty numerous, and they are generally of the higher and middling ranks its society; the lower orders of the community having hitherto found little inducement to intrude at South-end, as they do at some other places, which are better established. The THEATRE, at present, is sufficiently humble, but they who seek amusement and innocent relaxation, will not regard that want of elegance which they must be sensible cannot be afforded. It is its contemplation, however, to fit up a better theatre, where the admirers of the drama may have both their eyes and ears feasted. The LIBRARY here is a respectable one, and only wants additional subscribers to render it still more so. The HOTEL is an elegant pile, with well adapted and extensive stabling; nor are the SHIP TAVERN and HOPE INN wanting in adequate accommodation. The country round Southend is rich and populous, and agriculture is carried on with success and assiduity. The white-fronted dwellings of the yeomanry and farmers add to the beauty of the landscape, whatever Gilpin and Price may urge against the use of lime externally; and there is as little squalid poverty to disgust or to wound, as is to be seen in most situations. There are two coaches which run from London to South-end, one by the upper, and the other by the lower road, and carry passengers at a moderate price. For those who prefer an aquatic excursion, the boy, which possesses tolerable accommodations, may be engaged, at 5s. each person, from Billingsgate. From the upper part of South-end the spectator will enjoy a fine moving picture of the shipping, on that great commercial river the Thames; and, as this neighbourhood abounds with game, sporting gentlemen may amuse themselves in shooting, at the same time that they are bracing their nerves by dipping in the sea. Not far from South-end is a stone placed to mark the limits of the Lord Mayor of London's jurisdiction. Use the "Show me" link to locate South End on the map. You may need to scroll down to see South End highlighted. I must beg you not to talk of the sea. It makes me envious and miserable; I who have never seen it! South End is prohibited, if you please. My dear Isabella, I have not heard you make one inquiry after Mr. Perry yet; and he never forgets you."